The young nestlings are directly fed raw meat starting day one. Eagles do not regurgitate food to feed their young like some other animals do. During the first two weeks, the male provides most of the food. After 3 or 4 weeks, the female provides as much food as the male, and by the late nesting period, the female provides most of the food. Eaglets are fed 1-8 times a day. The parents carry prey to the nest to feed their young. They feed their chicks by tearing off pieces of food and holding them to the beaks of the eaglets. The parents tear off bits of prey and feed them directly, bill to bill. 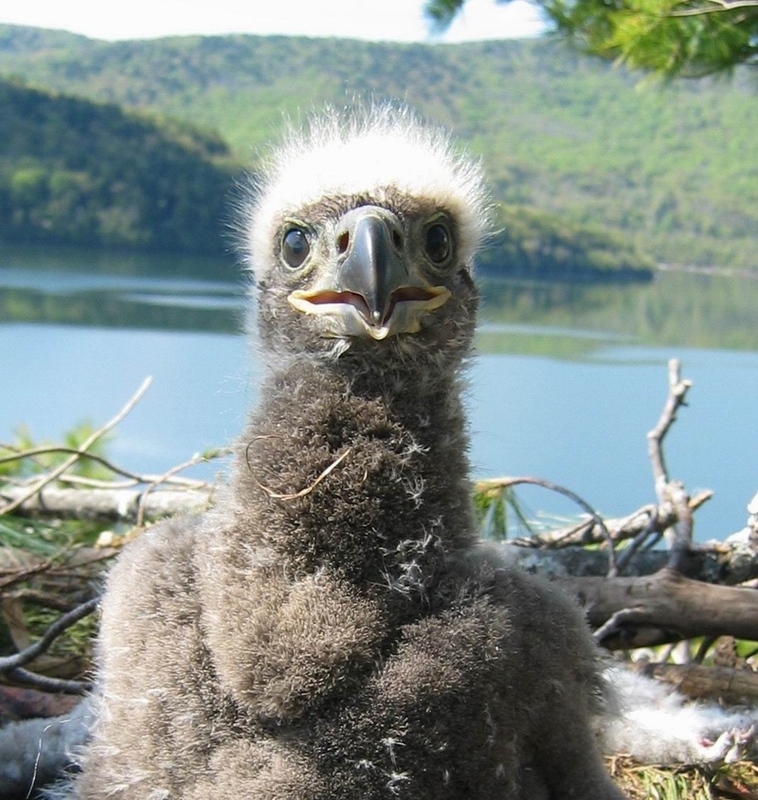 In the nest the oldest eaglet can act aggressively toward their siblings. 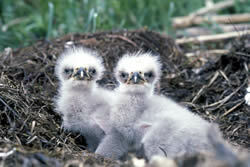 The older, and larger eaglet often tries to dominate or even kill its sibling(s). 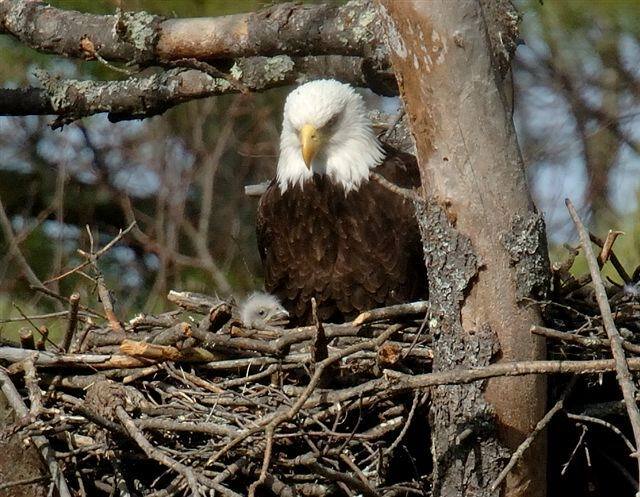 Eagle parents protect their chicks from the cold and the heat. On sunny days, parents sometimes spread their wings to produce shade for the chicks. After hatching, chicks are wet, exhausted, and nearly blind. Their eyes, dark brown in color, are closed, but open after a few hours. A newly-hatched chick can’t regulate its body temperature and relies on the parents to keep it warm. In the second week the chicks can hold up their heads. Their plumage darkens. 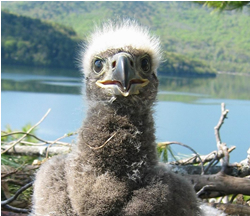 Now the eaglet can maintain its own body temperature under normal weather conditions without brooding from an adult. As the babies grow you may see them poking their heads above the nest rim, especially by about 5-6 weeks of age. Parents begin spending more time away from the young and often perch in nearby trees. 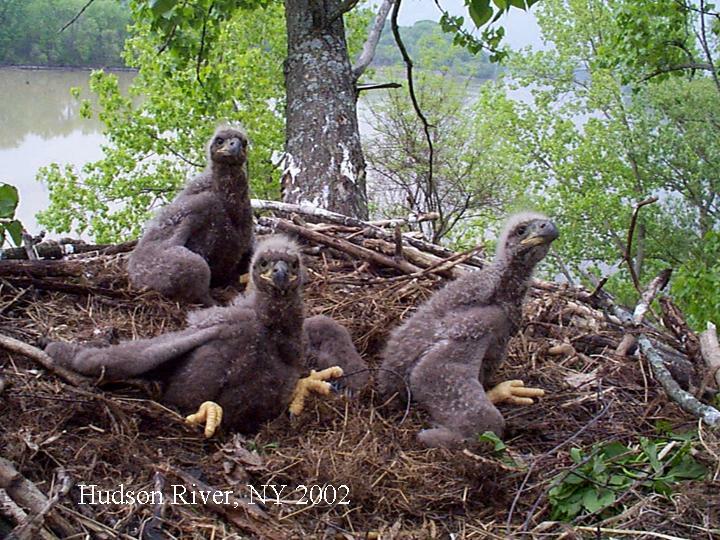 Adults will feed their babies directly until the eaglets are five to six weeks old, when the young are able to tear pieces of food off and feed themselves. By age 5 weeks, male and female parents bring relatively equal amounts of food. Parents begin spending more time away from the young and often perch in nearby trees. By six weeks the young are able to stand and walk, and by seven weeks maximum body growth nearing completion. By the time chicks are 9 weeks old, they are fully grown. Chicks continue on the nest gaining strength for 10 to 12 weeks. As the babies eat, poop, and grow, the nest starts getting dirty. The babies usually lean over the edge of the nest to poop, but once in a while they miss! Food particles remain in the nest after each feeding. After a while, the nest becomes a stinky mess. Eagles don't clean their nest. Instead, they add fresh leaves and other plant parts to cover up the rotting food and eaglet poop. Over time nests get pretty gross with old, maggot-filled fish parts stuck in the sticks of the nest, baking in the hot sun! Eagles often build "alternate" nests, within their territory, likely in an attempt to let one nest sit unused for a year or two, to allow it to "weather" and clean itself out.